The Korg Slimpitch chromatic tuner has a dedicated microphone and a vivid, full colour display. It's a compact tuner ideal for brass band and orchestral performers. 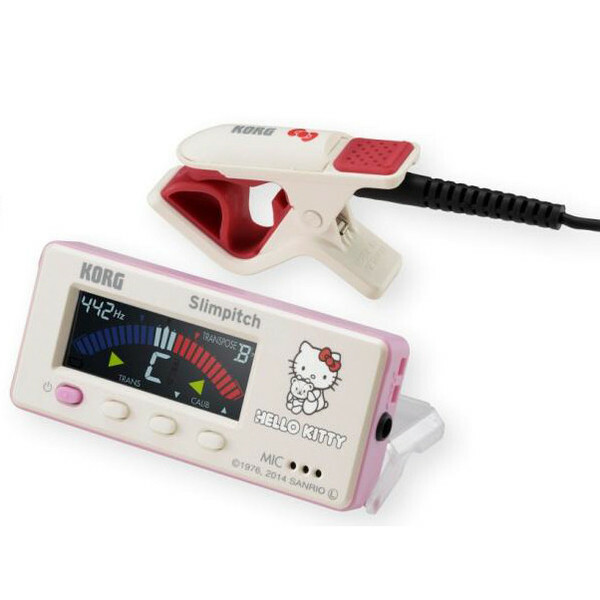 The Korg Slimpitch tuner has a compact body making the unit small enough to fit in your hand. 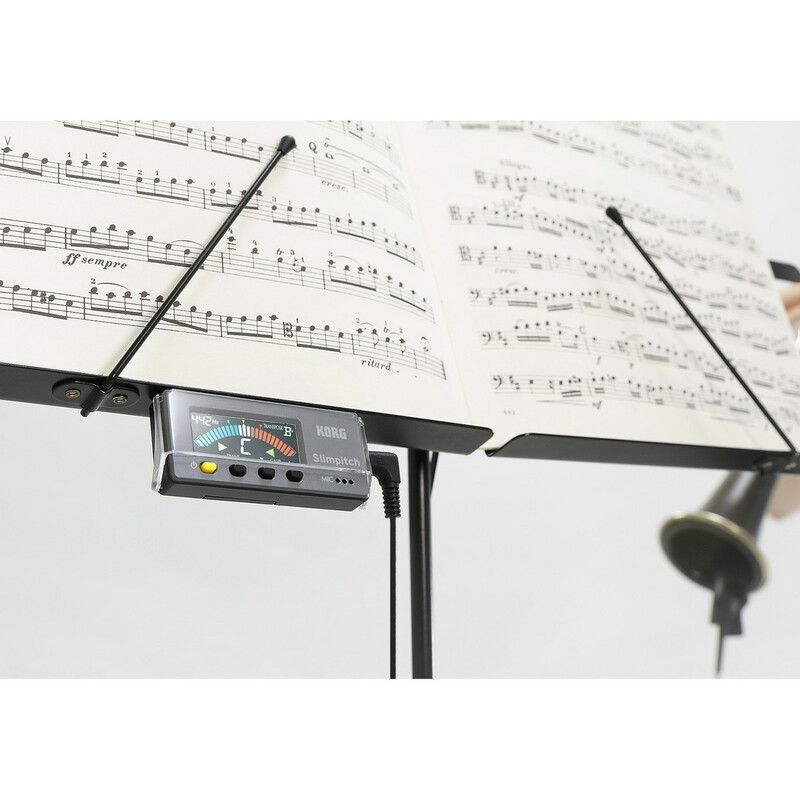 A dedicated contact mic is included, and a newly-developed magnet mechanism lets you attach the unit to your music stand without obstructing the sheet music. This unit features a colour LCD display, a brilliant white backlight and an extremely clear colour VA meter provide high contrast with a wide viewing angle. In addition to improving visibility, the text and the meter display are colour-coded for dramatically easier pitch recognition. Rather than having to watch the meter, the performer merely has to sense it giving instant recognition of your tuning status. In cases where it's difficult for the built-in mic to pick up your own sound, such as when everyone is practising at the same time, you can use the included contact mic. This mic provides excellent sound transmission, durability, and fit. The Slimpitch uses a 3.5mm mini-jack as for the external contact mic allowing the entire body to be more compact. The Slimpitch is extremely small and fits easily into any case or pocket. It also weighs one third of the previous model. The tuner is ideal for music stand users as it attaches easily without obstructing the music or stopping you turning the page. A magnet is embedded in the upper part of the body, allowing the tuner to be attached to the lower part of any steel music stand. The tuner comes with an included metal plate for use with non-metal stands and a protective cover that can also be used as a stand for placement on tables etc. The Slimpitch has a broad detection range that covers every type of orchestral instrument and provides a calibration function that supports a variety of concert pitches. There's also a transpose function that lets you smoothly tune transposing instruments in F, Bb, and Eb as well as the conventional C scale. A variety of other functions are also available such as the auto power-off function which saves the battery if you forget to turn the unit off, and the memory backup function that preserves your settings even when the power is off.